AIRAH represents the entire breadth of the HVAC&R industry, from “the man in the van” to research-focused academics; from plumbers and fridgies to designers of the nation’s most high-performing buildings; from sole operators to the chief executives of large corporations. AIRAH offers a range of advertising and sponsorship opportunities for companies looking to expand their profile in the HVAC&R industry. Download AIRAH's 2019 media kit for an overview of AIRAH's integrated mix of print and digital communications channels. John McGrath by email, or call 03 8623 3007. As the official journal of AIRAH, Ecolibrium is the most influential HVAC&R publication in Australia. 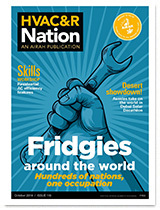 A monthly magazine for tradespeople and end users, HVAC&R Nation has the highest distribution and readership of any HVAC&R magazine in Australia. The magazine is direct-mailed to subscribers, as well as distributed free over-the-counter in more than 270+ outlets Australia-wide, including major industry wholesalers, distributors and TAFEs. HVAC&R Nation reaches tradespeople in the fields on electrical and mechanical services, mechanical contractors, technicians, plumbing, service personnel and installers. HVAC&R Nation has a readership of 32,855*. AIRAH produces a member and industry newsletter. ​The e-newsletters alternate each week for 45 weeks each year, with a break over the festive season. They have two advertising options: a central banner advertisement or an MREC (medium rectangle) position advert. Each can be linked to a nominated website. AIRAH's industry newsletter reaches 14,000+ AIRAH members and industry subscribers. It covers the latest industry news, and complements the HVAC&R News website. The member-only newsletter reaches 3,300+ AIRAH members. Content is tailored to suit each state and territory, and covers local and global industry news, AIRAH state events and conferences, AIRAH Industry Nights, training, links to editorial features in our publications, and more. The newsletters are a low-cost high-exposure opportunity, offering great value to advertisers. The newsletters reach CEOs, commercial market of facility managers, building services engineers as well as mechanical contractors, service technicians, installers, and refrigeration and air conditioning technicians. AIRAH has two websites with available advertising space: www.airah.org.au and hvacrnews.com.au. There are 545,000 views across AIRAH's websites per annum. The AIRAH website is the first port of call for anyone interested in the activities of the Institute. Thousands visit the site to register for conferences, training and other events, access online technical resources, and learn more about AIRAH. The HVAC&RNews website is another channel that adds weight to AIRAH’s promise – and strategic aim – of being the leading provider of HVAC&R news and information. Contact AIRAH's advertising executives to find out more.